Just how many different transitions and filters does one need? In truth, when Final Cut Pro first made itself known I recall trying to buy, borrow or copy any 3rd party plug in I could find. Now I have more than I will ever need, use or want. However, for many editors who have not amassed the numbers I have, the search for a good collection of filters, generators and transitions produced by Gee Three SlickFX may provide you with another valuable choice from which to choose. Each of these sets of plug ins requires Mac OS 10.4 or higher, Final Cut Pro 5.1.2 or later or Final Cut Express 4 or later and will work on both Intel and Power PC Macs. All plug ins can be located in the library/plug-ins/FxPlug folder. 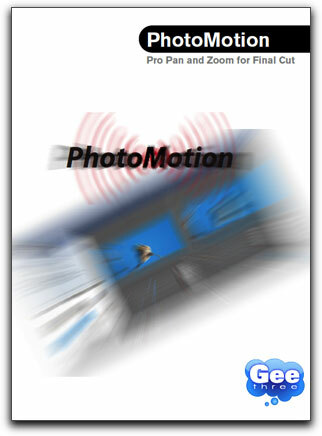 PhotoMotion is probably the most unique plug in of the group as it makes the creation of pan and zoom animations ("Ken Burns"effect) quickly and efficiently. Found in the generators of your effects tab, the media browser of the PhotoMotion interface allows you to choose individual photos or folders from Aperture, iPhoto or Lightroom as well as providing a 'search' function to make locating that photo even simpler. 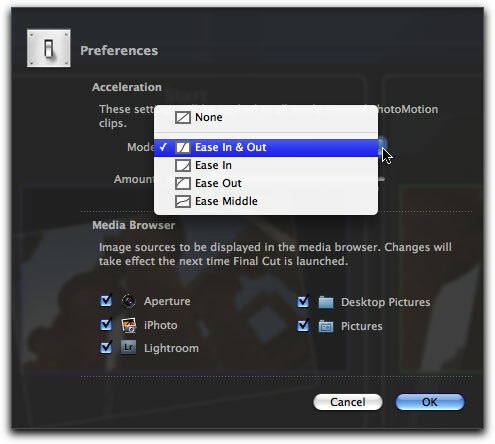 The preferences of PhotoMotion where you select from whichever application or folder as sources for your images. You can also drag a folder from the desktop to the Photo Motion media browser and do your search from there. If you decide to change the choice of your photo, just drag or double-click on another photo and the substitution is made. 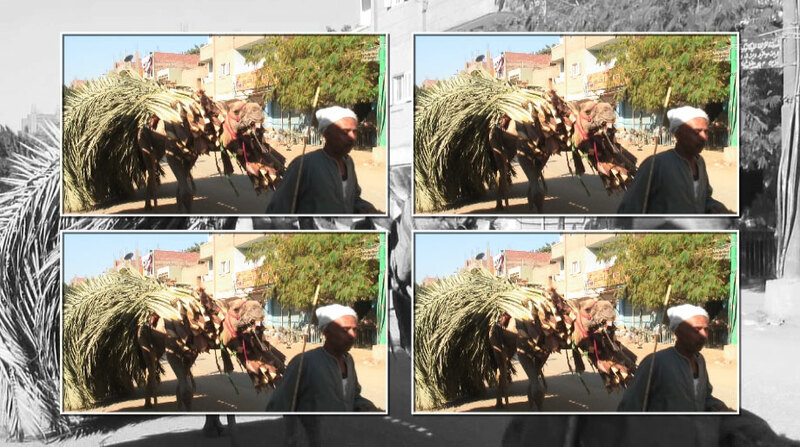 In the interface you have easy to use sliders to adjust the scale, rotation, zoom and position of both the starting and ending points for each photo as well as a handy 'copy keyframes' control that allows you to apply the same attributes to the next photo should you so choose. 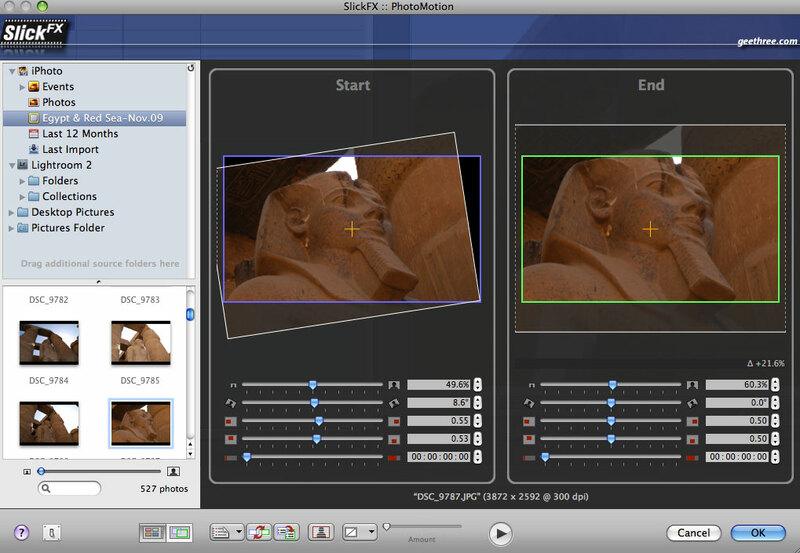 The PhotoMotion interface where you can either use the default settings or create your own positionings, zooms and timing. What is particularly welcome is that PhotoMotion inherently knows the aspect ration of your project and automatically compensates for non-square pixels and widescreen. No longer do you need to fret about adjusting the size of your original photos in Photoshop or some other software. 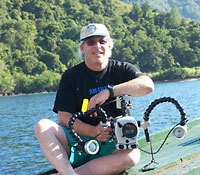 There are plenty of controls to play with and all of them are intuitive, even for the beginner. You can create and save keyframe motions as photo animations to be used for new projects as well as reverse keyframe motions with a single click. Also provided is PhotoMotion's own anti-flicker control, which, because I could not bring any of my pictures to flicker, I didn't test out. Once you have finished with your settings just click on the done button. Should you change the duration of the clip in the Final Cut timeline, there is no need to go back and reset your Photo Motion parameters, as it will automatically adjust the animation to fit. Using open GL, rendering a single 4 second photo animation took about 20 seconds and monitoring it on an external HDMI set revealed clean, smooth lines with no color resolution loss or jagged edges within the photo. If you have applied a number of Photo Motion clips to your timeline and wish to place a transition between them, you won't have to bother with setting in and out points as PhotoMotion will automatically add an additional 15 frames allowing for the transition. 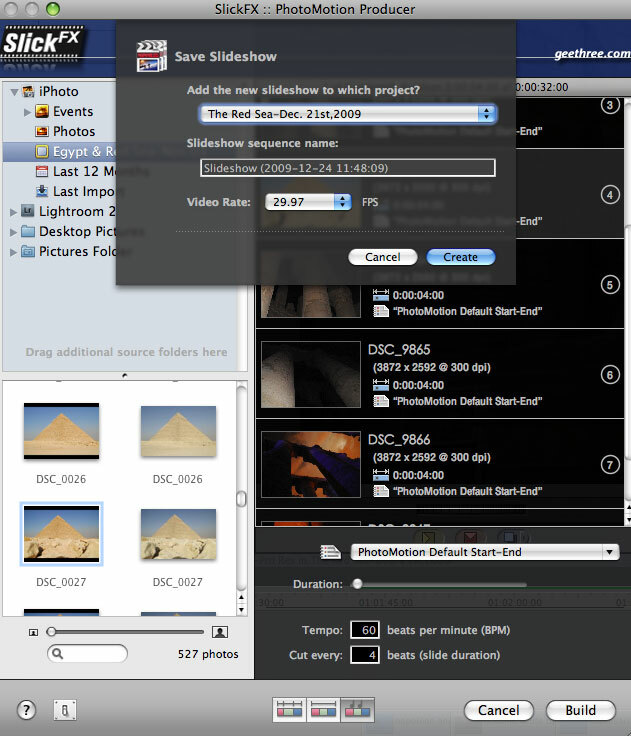 The PhotoMotion Producer takes PhotoMotion a step or two further as you can use it to create slideshows utilizing as many photos as you like while retaining the same flexibility to set the duration and parameter settings within the same interface as PhotoMotion. Once you have selected the duration for your photos, PhotoMotion Builder will build your slideshow for you as a new sequence. There is also a setting whereas you can set the slideshow to the beats per minute for the music of your choice. This feature, however, does not read the music for you so you do need to know the correct bpm of your music to utilize it. The SlickFX Fusion Factory is so full of possible choices that I found myself killing a few hours just playing around with it. Within this one filter are 750 possible styles of different wipes, radials and patterns. The organic transitions were particularly pleasing. Organic bursts, plasmas, fluids and many more, each had its own large assortment of styles to apply. Inverting any of these effects provides that much more diversity. The Fusion Factory HD, compatible with Final Cut Pro 6 or 7, played fine in real time and was as easy to use as you could ask for. For those with already large collections of 3rd party plug ins, my guess is that you will be happy to add this one to your arsenal. There are far too many options to bother counting but what you can create here promises to be extraordinary. 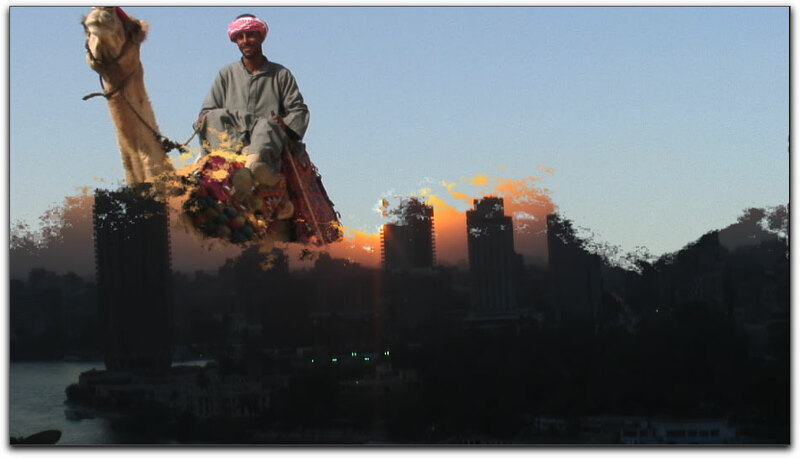 Using one of the Organic Vapors from Fusion Factory HD, this camel herder transitions to a clip of Cairo in the evening. The SlickFX Essentials package is, for the most part, a large collection of more than 60 of many of the same transitions and filters we have seen before. There's the typical ripple, cylinder, vortex and dissolve transitions accompanied by the barn door, mosaic, spin, rotate and many more. A complaint I have been nurturing as of late regards many 3rd party plug in companies who produce what are essentially the same filters or transitions as other companies but call them by other names. Perhaps they do this to stand out but for the editor, a standardized name for a specific action or tool is always best. A cross dissolve is a cross dissolve and not a 'clip extension teleportation and disappearance of metadata' transition. While one company's plug ins may or may not be of better quality, I still want to be able to find it easily and not have to decipher alternate naming patterns. 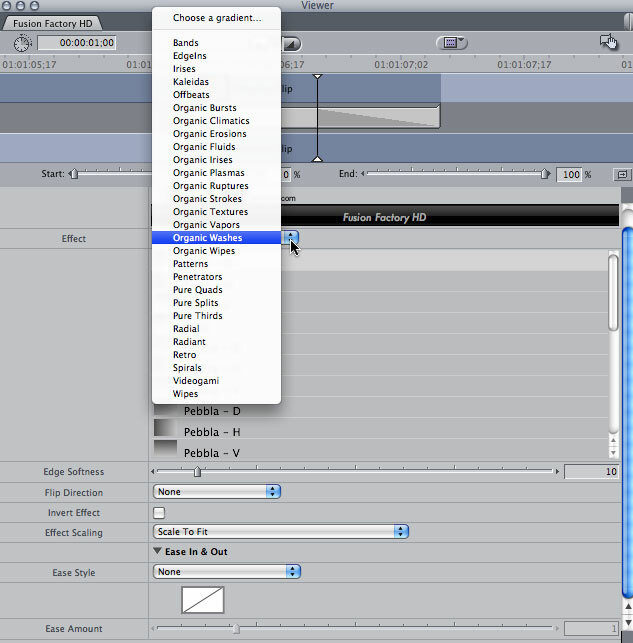 Despite the redundancy of the type of transitions, there is much to like regarding the supplied filters and generators. There is a countdown generator that provides 5 different countdown styles and full ability to control the sweep style and colors. The 'Countdown' generator supplies you with an easy way of applying time code to a clip or nested sequence with either count up or count down option. A 'Film Rating' generator is sure to bring a laugh or two as it reproduces the ratings poster that we see prior to the playing of both previews and movies. You have full control over the text and colors. The controls tab of the Film Rating generator wherein you can add your own bits of wit. The SlickFX filters are a set of 8 filters which range from an excellent 'Drops' filter which provides many choices as to the type and appearance to the below Double Play filter from which you can create a two or four up display. to provide background. You can keep or remove the frame around each of the images. There are 5 SlickFX titles also found within the generators offering the type of titling options that I found pleasing and easy to apply. 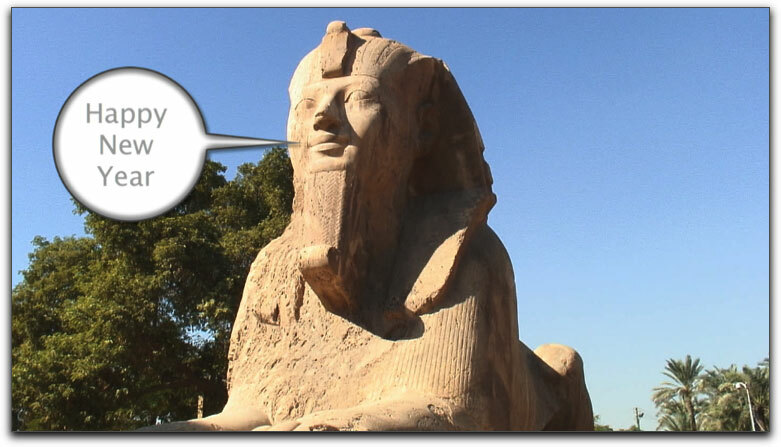 Their styles of animated texts are stylish and professional without being garish or outrageous. From the SlickFX titles generators, pictured here is what they call "Passage Duet"
where the foreground text passes from right to left over the same text in the background. One text offering whose uses would probably be best for comedic purposes is the Popup text. You've seen it before when a clip shows someone and a cartoon blip pops up on the screen. Think of the old Batman T.V. show with its Wham, Bam, Boom pop ups. There are 20 different styles of balloons found within this one generator. My only complaint is that you cannot keyframe the position of the balloon, as your subject is moving within the clip. The Popup text balloon with a timely message. Unique as compared to many plug in collections are the SlickFX Actions which makes creating moving animations of texts so much easier. You create the text using whichever text generator you wish and apply any of 9 different 'Actions' to them. You can apply more than one action to a text so that it can come in with a dissolve and then push itself off-screen. You really are limited only by your imagination and your projects requirements. An excellent video tutorial is supplied on the GeeThree website that will explain and demonstrate it further, but these were very easy to use and a great timesaver over creating your own text motion graphics. 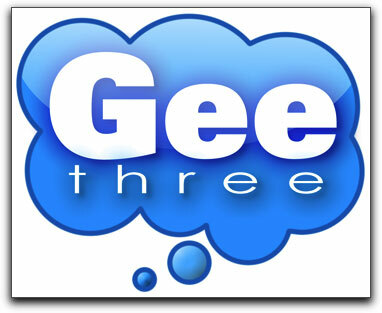 Actually, there are several video tutorials on the GeeThree website as well as demo reels of each of these three sets. The video tutorials that are already up, with the promise of more to come, clearly demonstrate some of the better ways to use the SlickFX Photo Motion, Action Transitions, Text and others. One Action filter I wish they had up was for an action they called Slow Frame. Not sure what it could do and after putting in a few keyframe changes, it produced a herky, jerky clip after rendering. My guess is that I simply misunderstood its purpose and I'm sure they will add a tutorial on the website soon. That will be good as the manual for their Essentials package is really not a manual at all but, beyond a page regarding installation and system requirements, is nothing more than a list of all their filters, actions and transitions accompanied by a picture from which you can see what the result might be. This is fine for transitions but for some of the filters, at least some text might be appreciated. My bottom line is that each of these 3 sets have something valuable to offer. 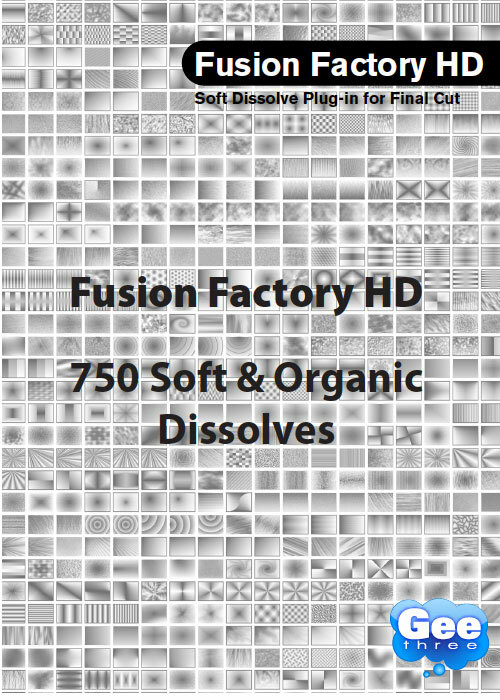 The Fusion Factory with its over 750 soft and organic dissolves is my favorite as I can see so many quality uses for it. Folks should be thrilled with PhotoMotion and PhotoMotion Producer as bringing in images without worrying about resizing makes a pleasant task out of what can be a frustrating enterprise. 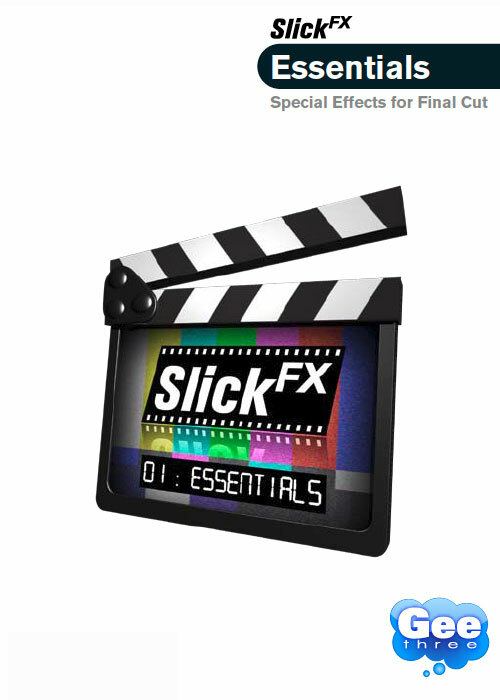 And for those who have not garnered an overly large effects browser and are in need of additional filters, transitions and generators the SlickFX Essentials collection should supply you with most of what you need. 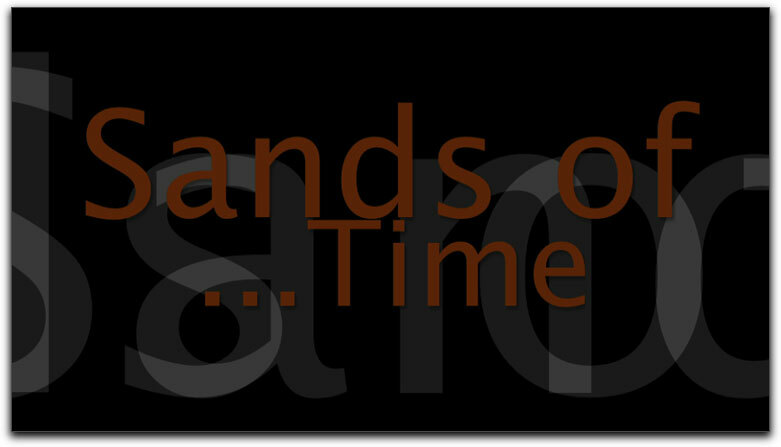 The Text effects and Actions transitions will certainly class up your opening and closing credits. Utilizing Macs open GL, these packages rendered quickly and most of them could be viewed in real time before rendering for previews. The prices on these packages are most inexpensive, especially when compared to many other 3rd party plug in companies. Registered users are kept in Gee Three's data base for notification of any free updates when they become available. GeeThree is a new company with some great products. They already have a good number of nicely created video tutorials to help you out with more to come and are definitely worth checking out.